Spin around the outside of the disc, and blow up everything that spawns within. It's a simple enough mechanic in the style of the previous Microbes/DiscBlaster games, but in a much more deadly manner. This time, the creatures are flailing all around the disc, and it can be alarmingly tricky to keep up with everything. But do your best, and blast them all! 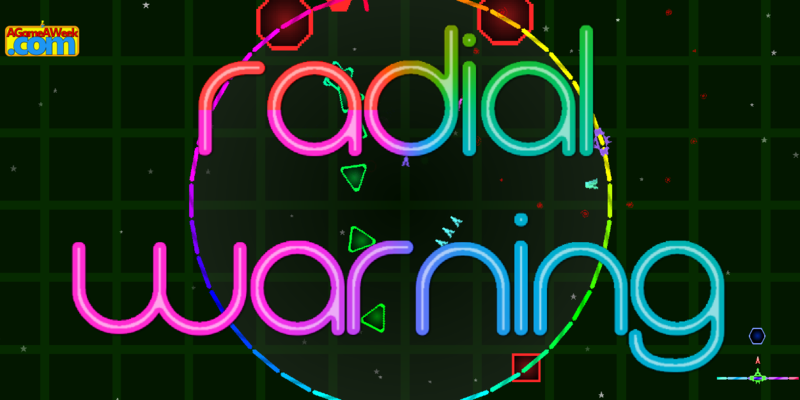 You can Download Radial Warning here for Windows, Linux, MacOSX and as 3DS Homebrew. Keep blasting! Blast like crazy!! Quite a lot was planned for this game, but it took AGES to get the game to "feel" good, so there's no "Waves", no different arenas, not many powerups, and a lot more little planned features are all missing. Even now, it can still be a little frantic, with you regularly losing track of where your own ship is within the arena. But strive on, and it can be a fun little timeout before you inevitably die! !